Equisetum arvense L. Sp. PI. 1061. 1753. Stems annual, provided with scattered stomata, the fertile appearing in early spring before the sterile. Fertile stems 4'-10' high, not branched, soon withering, light brown, their loose scarious sheaths mostly distant, whitish, ending in about 12 brown acuminate teeth; sterile stems green, rather slender, 2'-2° high, 6-19-furrowed, with numerous long mostly simple verti-cillate 4-angled or rarely 3-angled solid branches, the sheaths of the branches 4-toothed, the stomata in 2 rows in the furrows. In sandy soil, especially along roadsides and railways, Newfoundland and Greenland to Alaska, south to Virginia and California. Also in Europe and Asia. Ascends to at least 2500 ft. in Virginia. An occasional form in which the sterile stem bears a terminal spike is known as var. 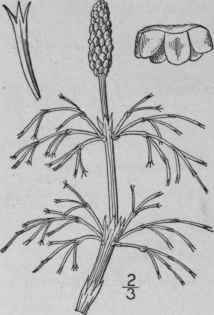 serotinum. Sterile stems sometimes very short and with long prostrate or ascending branches. Called also Cornfield Horsetail; Bottlebrush, Horse- or Snake-pipes; Cat's-tail. May. Equisetum pratense Ehrh. Hanov. Mag. 9: 138. 1784. Stems annual, 8'-16' high, with scattered stomata, the fertile appearing in spring before the sterile, branched when old, only its apex withering, the two becoming similar in age; stems rough, 8-20-ridged with narrow furrows and cylindric or cup-shaped sheaths; branches straight, rather short, simple, densely whorled, 3-angled or rarely 4-5-angled, solid; sheaths of the stem with about 11 short ovate-lanceolate teeth, those of the branches 3-toothed; rootstocks solid, acutely angled. In sandy places, Nova Scotia and Rupert River to Minnesota, and Alaska, south to New Jersey, Iowa and Colorado. Also in Europe and Asia. July-Sept.
Equisetum sylvaticum L. Sp. PI. 1061. 1753. 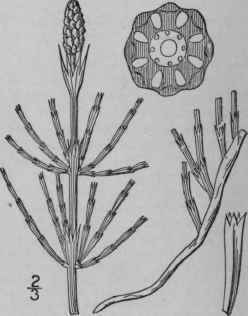 Stems annual, provided with scattered stomata, the fertile appearing in early spring before the sterile, at first simple, at length much branched and resembling the sterile, only its naked apex withering. 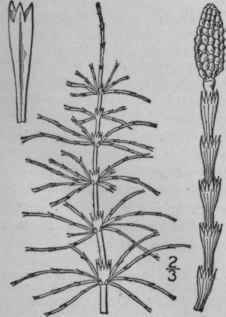 Stems usually 12-furrowed, producing verticillate compound branches, the branchlets curved downward; sheaths loose, cylindric or campanulate, those of the stem with 8-14 bluntish teeth, those of the branches with 4 or 5 teeth, those of the branchlets with 3 divergent teeth; central cavity nearly one-half the diameter of the stem; branches and branchlets solid. In moist sandy woods and thickets, Newfoundland and Greenland to Alaska, south to Virginia and Iowa. Also in Europe and Asia. May. 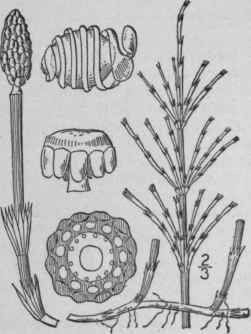 Equisetum palustre L. Sp. PI. 1061. 1753. Stems annual, slender, all alike, io'-i8' long, very deeply 5-9-grooved, the grooves separated by narrow roughish wing-like ridges, the central canal very small; sheaths rather loose, bearing about 8 subulate-lanceolate whitish-margined teeth; branches simple, few in the whorls, 4-7-angled, always hollow, barely sulcate, more abundant below than above, their sheaths mostly 5-toothed; spike rather long; stomata abundant in the furrows. In wet places, Nova Scotia to Alaska, Connecticut, western New York, Illinois and Arizona. Also in Europe and Asia. July-Aug. Marsh-weed, Paddock-or Snake-pipes; Cat-whistles.